Project MERCCURI: Space Station Microbiome and Microbes in Space – microBEnet: the microbiology of the Built Environment network. 2) Swabbing Sports and Space Events. Collecting swab samples around the country at sporting and other public events from cell phones, shoes, and various surfaces (e.g. keyboards, screens, railings etc.) These will be used for comparison to the ISS samples and for a look at microbial biogeography across a national scale. In collaboration with Jack Gilbert at the Earth Microbiome Project and the Science Cheerleaders who will be organizing and leading the sampling events. 3) Microbial Playoffs. A microbial growth competition on the ISS. A subset of samples collected at public events will be cultured at UC Davis and the “best” microbe from each environment will be sent to the ISS for a “microbial playoffs” competition. A duplicate of this experiment will be conducted on earth and the results compared. Details here. Check out our photo page here. I have started copying all of the information you have presented. What an interesting project!! I collect Space Patches and hope to obtain one of yours along the way now. But when I do, I like to have the information behind the patch, thus building my patch-fact file. I would appreciate ANY information especially on the design of the patch itself, by who? Reasons for colors used? etc. Thank you most kindly and GodSpeed on your success and the future of us all in Space! 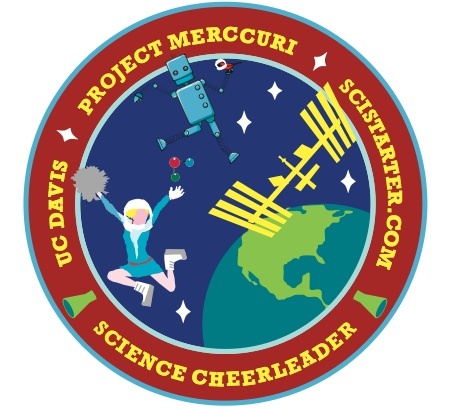 The symbolism of the items featured on the patch are described in this blog post: http://www.sciencecheerleader.com/2013/10/project-merccuri-mission-patch-activity-created-by-the-creative-folks-at-the-smithsonian-air-and-space-museum/ I hope this is helpful!